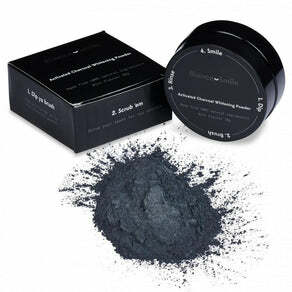 Bianco Smile’s activated charcoal teeth whitener powder is the ultra-premium teeth whitening solution made from natural and organic coconut charcoal. This 100% activated charcoal powder helps prevent cavities by not only whitening your teeth, but by removing plaque and detoxifying your mouth. In fact, it is considered to be one of the worlds most absorbent substances; providing high grade whitening for teeth stains without the use of bleach or harmful chemicals. Whitens teeth up to 14 shades lighter. Provides oral hygiene for your teeth and gums. Activated Coconut Charcoal, Sodium Dodecyl Sulfate, Calcium Carbonate, Allantoin, Menthol, Citric Acid, Natural Sweetener, Coconut Oil.